What are options? How to trade them? What are advantages and disadvantages of option trading on an exchange? What are risks and benefits? This article, which is based on the knowledge of a trader with more than 20 years of exchange trading experience, will help you to find correct answers. First, let us figure out what is an option? Well, an option is an exchange contract, which you can buy or sell. An option is a derivative product. It means that an option “is linked” with a specific asset. For example, if we speak about an oil futures option, this oil futures, in this case, is the underlying asset. Let us assume that you are an option buyer. It gives you the right to buy the underlying asset in future. Besides, it is not mandatory to buy the asset if you decide not to do so. If you sell an option, you become liable to perform certain operations with the underlying asset in future. PUT option. It is a sell option. If you buy a PUT option, you acquire the right to sell the underlying asset at a certain price. 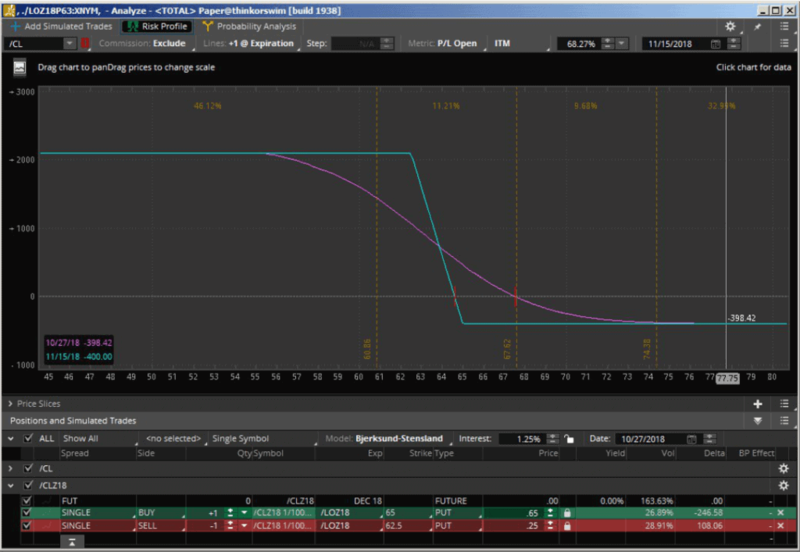 What is the option expiration? It is a time limit, which sets a date of expiration of validity of an option contract. Expiration Date is a moment when the option sellers have to perform their obligations and the option buyers have the last chance to use their right to buy/sell the underlying asset at a previously fixed price. An option becomes invalid after its expiration. If you buy an option, you pay a premium to the seller of this option. The premium is paid when a contract is executed. In other words, an option premium is payment for the benefit, which gives the right to execute trades with the underlying asset in future. When traders say “the option price”, they mean the premium. What is a price quote under an exchange option? This is also the option premium. Sometimes, they confuse the option premium with the strike price. What is the difference? The strike price is the price of the option execution. This amount is set when an option contract is executed. It determines the price, at which the CALL option holder can buy the underlying asset in future. Consequently, the strike price for the PUT option is the price, at which the PUT option holder can sell the underlying asset in future. What does a strike mean for the seller? It is a price, at which the CALL option seller is liable to sell the underlying asset and the PUT option seller is liable to buy a fixed amount of the underlying asset. There could be several options with different strikes on one and the same underlying asset. They are presented to traders in the format of the so-called option board. Example of the option board of a crude oil WTI futures (CLZ8) option with 22 strikes and expiration date on December 15, 2018. Naked options are options that do not have the real position backing in the underlying asset market. We speak here more about a risky speculation. If your operation with options is backed by a position in the underlying asset market, then, most probably, it is hedging (a method of insurance against losses). If you still have questions about option contracts, we recommend you to read the What options are article. This example considers a buy of a naked CALL option on an oil futures (CLZ8). The trader who buys this CALL option assumes that the oil will go up in price. Why not just to buy a futures? Because the future price quotes are more volatile and could trigger the buyer’s stop loss. 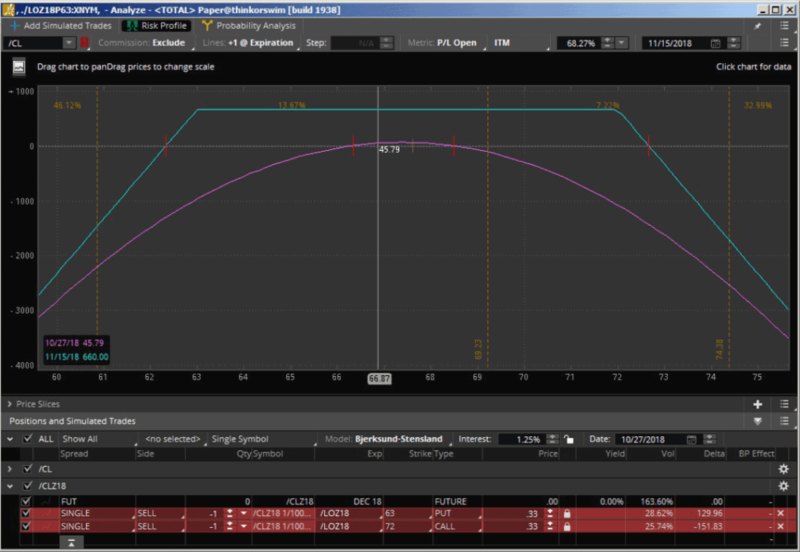 The screenshot shows that the trader has a purchased CALL option in his portfolio. expiration date – December 15, 2018. What are possible losses and profits? 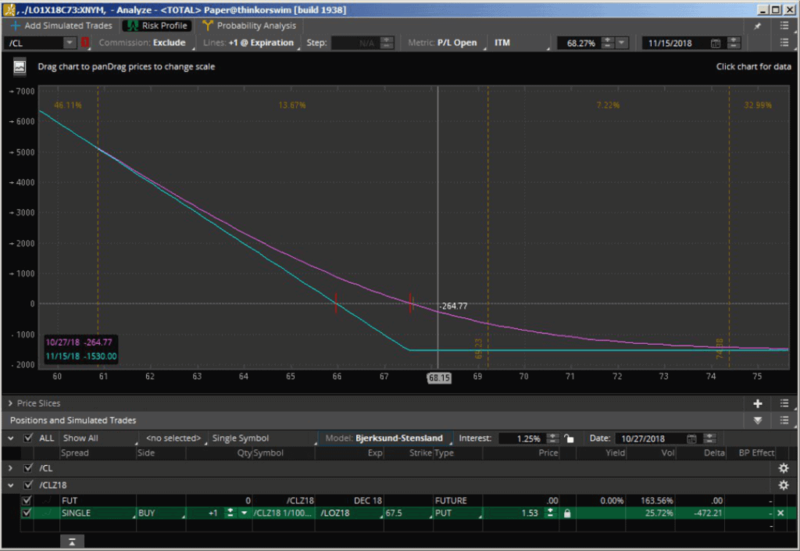 The polygonal blue line shows the profit/loss relation on the expiration date. For example, if the CLZ8 rate, on the expiration date, would be 71.00, the option holder will get the following profit: (71–67.50-1.53)*1*1,000 = USD 1,970. However, if the market reaches the level of 71 next day, the profit would be USD 2,200. The break-even price on the expiration date is 67.50+1.53 = 69.03. Which means, if the CLZ8 rate, on the expiration date, would be 60.03, the CALL option buyer will have neither profit nor loss. Consequently, the lower the price would move from the level of 69.03, the bigger the loss would be, but not more than USD 1,530. Why 1,530? 1.53 – premium for the contract. This naked option trading strategy is a mirror reflection of strategy No. 1. The naked CALL option seller has “a bearish vision” on the underlying asset prospects. He believes that the underlying asset value would go down or, at least, would stay at the current levels not surpassing the strike price. The maximum profit of the seller, in this case, would be equal to the premium received from selling the option. This amount is USD 1,530 in the screenshot example. At the same time, the seller takes an unlimited risk of losses if the underlying asset price would significantly grow. That is why, you should use this strategy with utmost care. Strategy of the naked PUT option purchase is similar to the naked CALL option purchase. The difference is that the PUT option buyer assumes that the underlying asset price would go down. 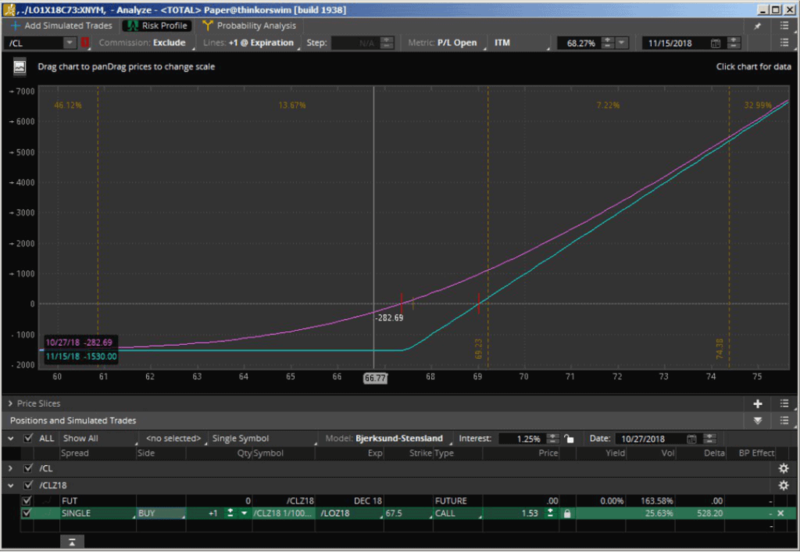 As it was in the situation with the naked CALL option purchase, the PUT option buyer has a prepaid maximum risk in the amount of the option premium price and a theoretically unlimited profit. The PUT option seller assumes that the underlying asset price would stay at the current levels and would not surpass the strike price or would grow. As you understand, the seller takes an unlimited risk of losses within this strategy if the underlying asset price will go down. That is why, you should use this strategy with utmost care. To strangle means to suffocate. The sold strangle strategy lies in simultaneous selling of the CALL and PUT options. What is the idea of this operation? The strangle seller assumes that the market would be inactive in future and the underlying asset price would stay within the range of selected strikes. The strangle in our example consists of the sold PUT with the strike of 63 at price of 0.33 and sold CALL with the strike of 72 at price of 0.33. If the underlying asset (CLZ8) does not surpass the 63 and 72 levels by the date of expiration, the seller gets profit in the amount of the sold premiums. Break-even points are calculated as 63–(0.33+0.33) = 62.34 and 72+(0.33+0.33) = 72.66. If the underlying asset price would go outside the 62.34..72.66 range boundaries, the strangle seller starts making losses. Watch out! Maximum losses are theoretically unlimited. The purchased strangle strategy lies in simultaneous purchase of the CALL and PUT options. The strangle seller assumes that the underlying asset market would be active and the price would go outside the range of selected strikes. 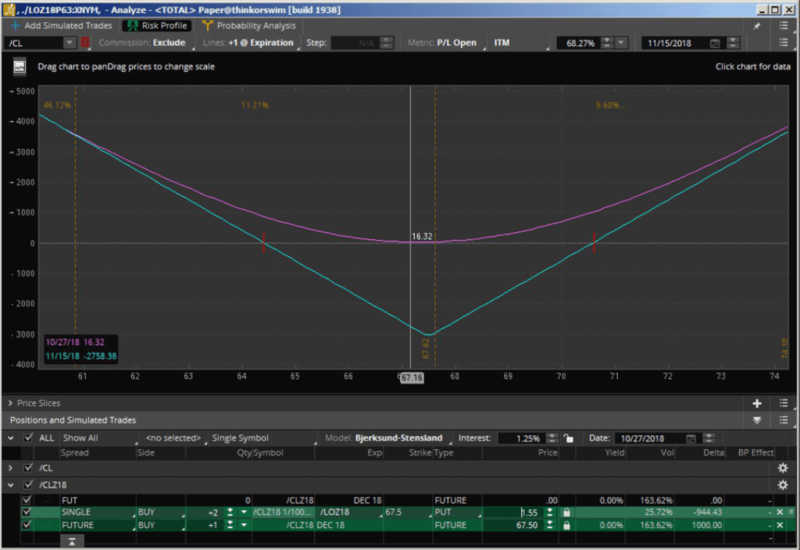 The strangle in the screenshot consists of a purchased PUT with the strike of 63 at price of 0.33 and purchased CALL with the strike of 72 and price of 0.33. If the underlying asset (CLZ8) does not surpass the 63 and 72 levels by the date of expiration, the buyer makes losses in the amount of the sold premiums. The break-even points are calculated as 62–(0.33+0.33) = 61.34 and 72+(0.33+0.33) = 72.66. In the event the underlying asset price goes out of the 61.34..72.66 range boundaries, the strangle buyer starts making profit. Maximum profit is theoretically unlimited. To straddle means to play a double game or to conduct a twin policy. Compared to the strangle purchase, which was considered in the previous strategy, the synthetic straddle purchase is a more aggressive trading. The name “synthetic straddle” is applied since both the underlying asset option and the underlying asset itself take part in this strategy. two purchased PUT options with the strike of 67.50 at the price of 1.55.
and one CALL option with the strike of 67.50. What is the idea of a synthetic straddle? Break-even boundaries become narrower due to the fact that an option is purchased with the strike, which is very close to the market price of the underlying asset. In other words, the straddle purchase brings profit much faster than the purchased strangle from the previous strategy. However, there is the reverse side of the coin. Straddle buying means an increased cost of ownership and maximum risk. 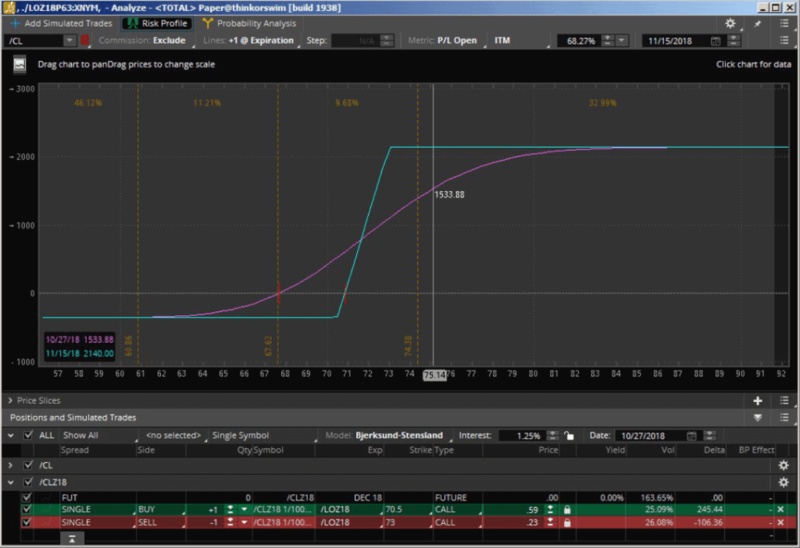 Bull Call Spread buying is a one-time sell and buy of CALL options with the same expiration date, but with different strikes. 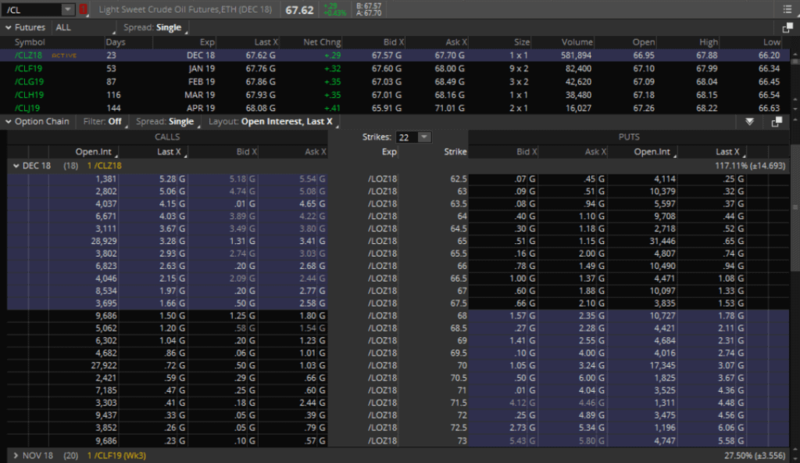 Bull Call Spread in the screenshot consists of the purchased CALL 70.50 option and sold CALL 73 option. What is the idea of the strategy? Bull Call Spread strategy is used if a trader expects that the underlying asset price will go up but moderately. Bullish Call Spread is characterized with low cost of ownership and high risk/profitability relation. The ownership cost (maximum risk) is calculated as a difference between the paid and received premiums. 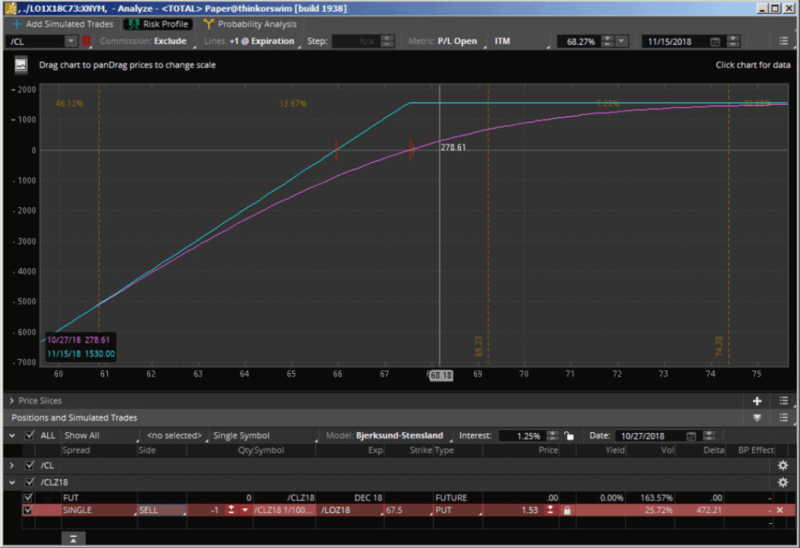 The maximum risk in the screenshot example is (0.59-0.23)*1*1,000 = USD 360. The maximum profit is equal to the difference in strike prices less the ownership cost (73-70.50)*1*1,000 – 360 = USD 2,140. This strategy is a mirror reflection of the previous strategy – Bull Call Spread buying. The Bear Put Spread strategy is used if a trader expects a moderate underlying asset price reduction. The methods of calculating the profit and risk are absolutely identical to the ones from strategy No. 8. Option trading strategies open new opportunities for making profit in the financial markets. But watch out! A dangerous feature of some of the strategies is a risk of unlimited losses. Is it possible to learn how to trade starting from scratch? What futures and a futures contract are?